Well, I'm trying to finish up a draft of my paper for the Pastorius Conference. It reprises work I did ages and ages ago on Francis Daniel Pastorius' Young Country Clerk's Collection. (An early version of the article is here.) The Collection was -- so far as I can tell -- the first legal treatise written in British North America. It's a collection of forms, for contracts, land sales, wills, a couple for trusts, and a few forms for the arbitration of disputes and for the prosecution of criminal behavior. But Pastorius leaves out forms for civil suit. I compare the Collection to the English books he relied upon to get a sense of what Pastorius thought was important and also to see how he tried to subtly reshape Pennsylvania law. An important part of that project was locating Pastorius' grander ideas about justice, law, and magistrates in his common place book (what he called his "Bee Hive"), as well as in his letters home to Germany, and in his other writing -- like the records of one of the courts he presided over. That also involved trying to locate Pastorius' writing in the larger world of Quaker thought -- mostly the writings of George Fox and William Penn. My hope was to understand as much as I could about Pastorius' thought from the written record left by Pastorius and his contemporaries. One of the things that interested me at the time -- but that I didn't explore completely -- was the importance of Quaker writings about their suffering under the English legal system. George Fox's Journal and those of other other early Quakers, like Thomas Ellwood and Isaac Pennington, dealt with the injustice they suffered in the United Kingdom and New England -- everything from the monopoly that lawyers exercised in some courts, so that individuals could not be heard without a lawyer, to the failure of judges to follow the law as written, up to even the execution of a few Quakers for their religious beliefs in New England. I was particularly intrigued by this: William Penn was prosecuted in 1670. Not long later, he was proprietor of Pennsylvania. Though that wasn't the language used at the time, one might now think of the Quaker experience in Pennsylvania as an episode of "transitional justice," of people emerging from an oppressive regime and re-imagining what their world should be. And when the Judge is askt by the prisoner concerning the hat, what Law and custom is for it, and where he may read it? Oh, cryes the Judge, and swells, and rages, and full of fury, I doe not carry my Law books upon my back; I but faith the poor prisoner, the Judges of old was legs to the lame, and eyes to the blind, and a help to the helpless, and why wilt not thou and you inform me of that Law and custome that sayes, I must be fined a hundred mark, and forty pounds, if I will not put off my hat to you. . . and thus the poor prisoner goes away uninformed in the Law and custom, not knowing the ground and the author of it, the Judge not informing him, contrary to Moses and the Judges of old, and the Scripture, which saith, They shall teach them in the Law, and instruct them in the Law . . . that all might know it and fear. Anyway, my paper, which I'll be posting fairly soon, links Pastorius' statements about justice, law, and magistrates to the Quakers he was reading. Pastorius' ideas were -- like Fox's and Penn's -- basic and fundamental: a reliance on the golden rule, advice to magistrates to follow the law as written, and advice that they look after people who are poor and otherwise unable to defend themselves. The illustration above is a link to the inside of the Caln Meeting House, which is one of the oldest Quaker meeting houses still in use in the United States. I'd looked around for an illustration of the inside of a meeting -- my thought was I'd like an illustration of the inside because I'm trying to get inside Pastorius' mind. 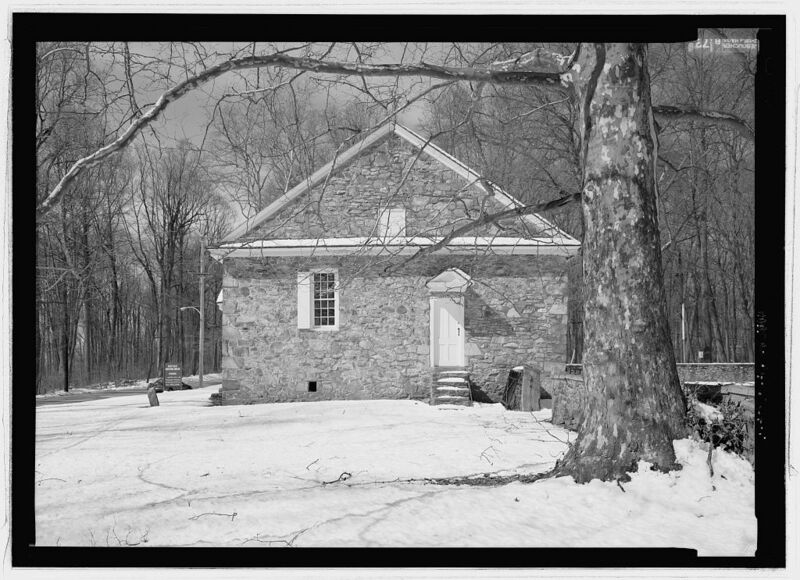 Parts of the Caln Meeting House was built in 1726 and Pastorius died around December 1719, so this structure wasn't in existence during his life. But it's pretty close, as close as I've been able to come to a Quaker meeting house in existence in Pennsylvania around Pastorius' time. The image at left is from the Historic Buildings Survey. Next time I'm home, perhaps I'll take a couple pictures of it -- and the Downingtown Meeting, too. Update: Actually, on my last trip home, I didn't have a chance to get back to the Caln Meeting, I did get this late afternoon picture of a meeting house up by Lionville. Update: Here's my paper, “You that sit at the stern”: Quaker Thought on Law and Magistrates in the Age of Fox, Penn, and Pastorius. This is really interesting! I look forward to reading your paper, but from what I see here, it seems as though Pastorius had some rather progressive ideas about reshaping the law and the legal system in a way that was truly fair and understandable to everyone. I think he'd certainly have mixed (but mostly negative) feelings about today's legal system if he could see it. Again, I look forward to the whole paper--and wish that there would have been a course on historical legal theories at my law school--the legal field could benefit from a study of its history just as much as any other field. Thanks for the kind words, GJEL; I'm looking forward to having the paper finished, too! You're right that reshaping the law in a way that's understandable (let's write down the rules and post them so everyone knows what they are) was a key part of Pastorius' thought -- and a lot of other people, like William Penn. Quakers (and other radical Protestants) were also big on following the rules once they're written. Pastorius was anti-lawyer (he didn't think people should be allowed to take money for pleading cases), too. My understanding is that Quakers were not especially pro-lawyer--that Friends would not sue each other, for example. And I don't know if in general Quakers were in favor of having rules written down and then following them, but of course one of the things that Quakers are most known for is disregarding the rules enforcing slavery. There was a split among 17th century Quakers on whether it was appropriate to file civil suits; some (I suppose it was a majority) found it acceptable. Pastorius was among those who thought suits acceptable, but he didn't particularly approve of them (hence the lack of forms in the Young Country Clerk's Collection). William Penn was in this group as well. The anti-lawyer sentiment was related to their opposition to lawsuits -- lawyers made money from suits. At one point Pastorius criticized people who made money from pleading and from preaching, as well.